﻿is the ﻿coordinator ﻿for this ride. pre-rides, ride day sign-in/sign-out, etc. This is fully unsupported and you will need to be self-sufficient in order to complete. Please make sure to read all rules for this ride. The rules are located HERE. No more than 74 people allowed for this ride! Full DBT: 70-miles, with 11.5K of climbing! Goes up the north rim of Taos canyon, across Elliot Barker Trail (EBT) and down the south side of Taos canyon ending at Eske's Brew Pub. Goes across Elliot Barker Trail (EBT) and down the south side of Taos canyon ending at Eske's Brew Pub. No warranty, express or implied, use at your own discretion. Garmin users can download directly into their supported devices from the Garmin Connect pages below. Be sure to a test “Do course” to make sure the track downloaded properly. You can also export the track to GPX from these pages, load into TopoFusion and then download to your GPS. Use this option for non Garmin users and those that above option dosen’t work. ​Please pre-ride the NBT if you get a chance. This is primitive country and requires a good level of route finding skills, which is something that can take time and slow you down. This route can be completed with minimal stopping, so please make sure you know the route beforehand. The route consists of 3 distinct sections of classic Northern New Mexico back country trails; North Boundary Trail (NBT) to Elliot Barker Trail (EBT) to South Boundary Trail (SBT) with Jaracita Trail Diversion. Each of these sections include epic singletrack, dirt two-track, and some gravel or paved road. From the public parking lot on Kit Casron rd, turn right on to Kit Carson and then immeditly right on to Montoya St. Take Montoya St south to Los Pandos Rd. Turn left on Los Pandos Rd and take it unitl it turns into Gusdorf Rd. Continue on Gusdorf Rd. to Crus Alta Rd. Turn left on Cruz Alta Rd and take it to NM 585. Turn left onto NM 585 and look for dirt trails off on the right hand side of the road parallelling the road – ride the dirt trails up toward the blue water tower that you can see in the distance. Follow signs and trail markers to the blue water tower. Turn left here and descend Tr. 164 down to the El Nogal Trail Head (on US 64). Right across the street is the start of the NBT at the Devisadero Trailhead. Note: If you get lost on this small initial section, just bail to Taos Canyon/US 64 and just go to the Devisadero Trail Head (Tr. 108). Most likely you can ride with other riders on this initial section of local cutover trails as all of this section is less than 6 miles from the start. Section 1 – North Boundary Trail (NBT) ~ 31 miles: The NBT is actually an collection of trails and dirt roads is not the official name of any one trail on this route. It is in specific terms Devisadero Trail (Tr. 108) to Capulin Trail Tr. 495 to Fr. 717 to TR./Fr. 494 Fr. 10A2 to Fr. 706A to Fr. 706. From Devisadero Trail, climb this epic route for less than a mile until you come to the first intersection that is marked with a sign. You can go either left or right when climbing Devisadero – as the Devisadero Trail is a loop and this is the start of the loop. Taking the left hand route will allow you to stay on the bike more, and the right hand side is the more technically challenging route – again your choice. At the far end of Devisadero on a saddle you will come to the Capulin Trail Head – turn here and follow this rugged and faint piece of epic singletrack as you climb on the north side of Taos Canyon. Markers should appear in trees along with rock cairns. This is a faint trail however and do not take any side route that descend steep down into the canyon. This trail CLIMBS the north side, ok. There are also Carsonite signs on this route in some (not all) places. As you crest the Capulin trail you will descend to Fr. 717 and follow this faint forest service road until it becomes more distinct. At the first major intersection – turn right and descend down Capulin Canyon on a gravel road. You will soon come to the intersection of 717 and Fr. 10 (The road from US 64 up to the Buddhist Monastary). Turn left on Fr. 10 and climb this until it approaches a metal gate for private property (saying No Trespassing). As you approach the gate, look over to your RIGHT and see the trail heading up the hill (if you miss it, turn around at the gate and you will see the trial heading up the hill to your left) – this soon turns into a old forest logging road and become FR 10A2. At the first major intersection turn left (uphill) and follow the 10A2 road constantly uphill and to the east ignoring all small logging offshoots or serious downhills. Some flagging and marking should exist. Follow this to 706A and eventually you will follow the Pueblo fenceline. As you come to Pueblo gate (No Trespassing) look to your right for the single track that goes around the Pueblo land. Follow it along the fence for a short distance until it turns left back towards 706A. You will go through a gate (not Pueblo land) just before getting back on 706A. Follow 706A and descend OK Canyon on down to US 64. Cross the paved US 64 and go straight accross through the fence to the treeline. You will not see any trail in this grassy area – untill you hit the treeline straight in from of you. Turn RIGHT and then LEFT to make your way up Bull Springs Canyon to Bull Springs Meadow. Eventually this will turn into a very rough and rocky old forest logging road, and to your left will be the meadow. You will cross a grassy field to get to the top of Bull Springs Meadow and all paths should have disappeared by now – this is cow type cross country. At Bull Springs Meadow you will hook up on the Elliot Barker Trail. However – instead of immediately turning right and heading south – you must first do the lower loop of EBT! Section 2 – Elliot Barker Trail (EBT) ~12.5 miles At Bull Springs Meadow, turn LEFT (yes left so you can restock at Palo Flechado) and descend the EBT for less than a mile – look for the first intersection on your LEFT and turn here (this is where the the lower legs of the EBT loop come back together). Follow this trail as it initially climbs, then will give you an immediate fun steep descent eventually taking to a Palo Flechado – the high point on US 64. When you see the paved road, you are at Palo Flechado – which simply means Flechado Pass. If you choose to set up a SAG vehicle this is the best spot to have one for you. There is a parking lot at Palo Flechado. If you skip the SAG and still want to go on, continue descending the EBT Tr. 1 all the way down to it’s official Trail Head on US 64, and then climb back up the EBT’s east-side back up trail then dirt roads to Bull Springs Meadow. This dirt road has whoop-de-dos, and ignore all offshoot singletrack. From here follow the inclined saw-tooth elevation profile of the EBT for several miles at the South Boundary Trail. The EBT is faint, but marked with Carsonite signs. However this is still primitive backcountry. When in doubt, head south on the EBT. You will finish the EBT at a steel cow water tanke, so all turns west before this are not correct! You will eventually come to an intersetion with the SBT at a metal cattle tank. This will be the start of the South Boundary Trail Section. Section 3 – South Boundary Trail (SBT) with Jaracita Trail Diversion ~25 miles: At the cattle tank, turn right and head uphill for an immediate steep climb up to OSHA Peak. At OSHA Peak (10,770-ft) you will intersect a dirt road (FR. 153). Turn left (yes left!) as you will skip the upper section of the SBT and start out this section of the route on the Jaracita Trail. Follow Fr. 153 south for less than 2 miles and look for the Jaracita Trail head sign on your right. Jaracita Trail is very well marked, but the turn to it’s trailhead is easy to miss. Follow this awesome and epic descent all the way down to Fr. 439 to the Rio Chiquito. Turn Right and climb this gravel road for a few miles up until you see a clearing on your right. This clearing is a rising meadow with a dirt road that takes you to Quintana Pass and will be your access point back onto the SBT. At Quintana Pass, turn left and follow the SBT all the way back to Taos taking the final technical descent down to the trail head at US64 and then the pavement in to town following US64 (Kit Carson road) towards the Toas plaza. Make sure you stay right (straight) at the first main intersection just after getting on the pavement. Once you hit the main drag in Taos, turn left though the dirt parking lot and wind your way over to Eske’s Brew Pub. The final rally point is at Eske’s Brew Pub! **** Meet at the public parking lot on Kit Carson road at 8:30am to work out shuttling up to the start. ​This route consists of 2 distinct sections of classic Northern New Mexico back country trails; Elliot Barker Trail (EBT) to South Boundary Trail (SBT) with Jaracita Trail Diversion. Each of these sections include epic singletrack, dirt two-track, and some paved road. From the start public parking lot on Kit Carson road up from Eske’s (Map locatedhere), shuttle up to Palo Flechado pass in US64 and be ready to ride a 9am. It is up to the Half DBT riders to orginize the shuttling up to Palo Flechado. It is recommended that this is done prior to the ride. From the parking lot at Palo Flechado pass, cross US64 to a gate in the fence that runs along the hwy. There you will find the EBT trail. Take the trail to left descending the EBT Tr. 1 all the way down to it’s official Trail Head on US 64, and then climb back up the EBT’s east-side back up trail then dirt roads to Bull Springs Meadow. This dirt road has whoop-de-dos, and ignore all offshoot single-track. After going through the fence take a hard left. This is where the fun really starts!! From here follow the inclined saw-tooth elevation profile of the EBT for approx 8.5 miles till it meets up with the South Boundary Trail. The EBT is faint, but marked with Carsonite signs. However this is still primitive backcountry. Section 2 – South Boundary Trail (SBT) with Jaracita Trail Diversion ~25 miles: At the cattle tank, turn right and head uphill for an immediate steep climb up to OSHA Peak. At OSHA Peak (10,770-ft) you will intersect a dirt road (FR. 153). Turn left (yes left!) as you will skip the upper section of the SBT and start out this section of the route on the Jaracita Trail. Follow Fr. 153 south for less than 2 miles and look for the Jaracita Trail head sign on your right. Jaracita Trail is very well marked, but the turn to it’s trailhead is easy to miss. Follow this awesome and epic descent all the way down to Fr. 439 to the Rio Chiquito. Turn Right and climb this gravel road for a few miles up until you see a clearing on your right. This clearing is a rising meadow with a dirt road that takes you to Quintana Pass and will be your access point back onto the SBT. At Quintana Pass, turn left and follow the SBT all the way back to Taos taking the final technical descent down to the trail head at US64 and then the pavement in to town following US64 (Kit Carson road) towards the Toas plaza. Make sure you stay right (straight) at the first main intersection just after getting on the pavement. 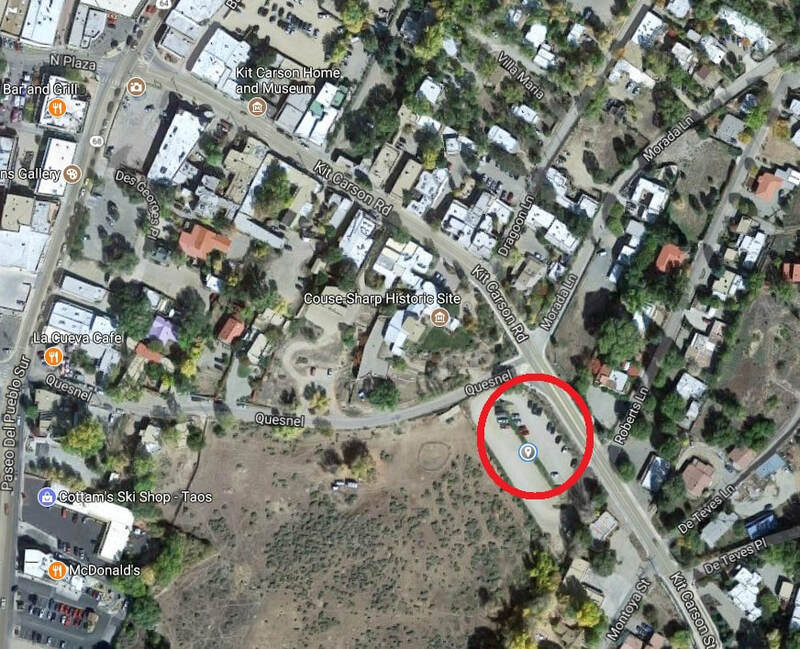 Once you hit the main drag in Taos, turn left though the dirt parking lot and wind your way over to Eske’s Brew Pub.